A good friend of ours recently lost her sister. Our prayers and sympathy go out to Jen, Dave, Alice and Josie during this sad and difficult time. 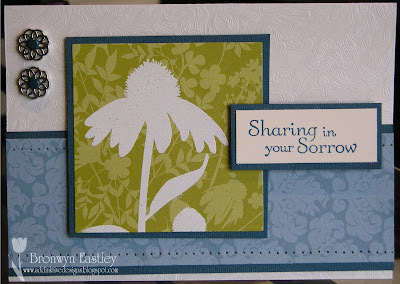 As the sentiment on the card says, we are "Sharing in Your Sorrow". Ros was a special lady, full of fun and laughter, despite her constant battle with ill health. She will be sadly missed by those that knew and loved her. Seeing that I needed to make a sympathy card, I thought I'd use it for Keesh's last challenge for the year. I didn't think I'd get a chance to enter as it has been a busy last week at school with getting ready for Presentation Night, finishing reports, submitting photos and written work for the school magazine and excursions to Green's Beach and the Launceston Zoo. I also had my Nan's funeral in Smithton on Monday and am currently the Guest Designer for a Canadian Blog (Card Patterns) so it has been a 'full on' week. I'll be able to breathe again soon before I start getting ready for a family Christmas get together at our place!! ... and then ... there's New Year's Eve! Thanks for stopping by, Bron.